Micro/sys' Blazing Frames™ Single Board computer nails fast data throughput providing eight 12.5 Gb/sSerDes for demanding vision, RF and other data handling applications. As embedded users include vision in their rugged application, having a turn-key, ready-to-run vision solution becomes critical for them to bring their application to market quickly. 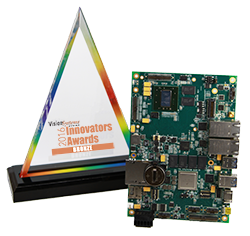 Micro/sys, a supplier of harsh rugged single board computer solutions, announced today that its Blazing Frames™ SBC4661 Vision Enhanced Computer Board was recognized by the judges of the annual Vision Systems Design Innovators Awards program. Micro/sys was honored with a Bronze-level award. Micro/sys’ Blazing Frames™ SBC4661-BVL is a single board computer with multi-camera interfaces and 12.5 Gb/s through-put, making it ideal for demanding vision applications using GigE Vision®, USB3 Vision®, CoaXPress or CamerLink® HS in harsh, rugged environments. Combining an ARM® processor and Linux, the groundbreaking innovation of the Blazing Frames™ SBC4661 is a smartly partitioned two-processor single board computer so that the host PC portion of the board can offload to the FPGA the receiving, sending, and processing of vast amounts of vision data at up to 12.5 Gb/sec without sacrificing performance of the host PC. Incredibly, the Blazing Frames™ SBC4661 reduces the power requirements for a vision system, making it reasonable to deploy a high performance camera with a single board solution in harsh rugged environments with less than 12W while being flexible enough to accommodate five (5) different camera interfaces. The judging panel consisted of esteemed experts from system integrator and end-user companies. Published since 1996, Vision Systems Design is a global resource for engineers, engineering managers and systems integrators that provides comprehensive global coverage of vision systems technologies, applications, and markets. Vision Systems Design's magazine and website (http://www.vision-systems.com) report on and analyze the latest technology, business developments and trends in the worldwide machine vision and image processing industry. 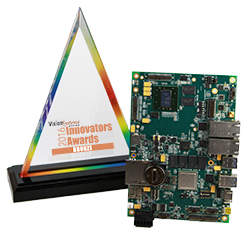 The Vision Systems Design 2016 Innovators Awards program reviews and recognized the most innovative products and services in the vision and image processing industry. Honorees were announced at The Vision Show 2016 held in Boston, MA, and feature in the June Issue of Vision System Design. Since 1976, Micro/sys has been specializing in OEM high-performance, compact, low-power industrial single board computer products suited for extreme temperatures. Pioneering the USB movement within the stackable computer market, Micro/sys is a leading provider of Host and Client USB microcomputer and microcontroller boards. Micro/sys embedded computers are specified by OEMs in a range of applications including semiconductor processing, medical, military, mail handling, pharmaceutical, industrial marking, process control, and many other industries. For more information, visit the Micro/sys website, http://www.embeddedsys.com.